Your back consists of several muscles including the trapezius, latissimus dorsi and erector spinae. 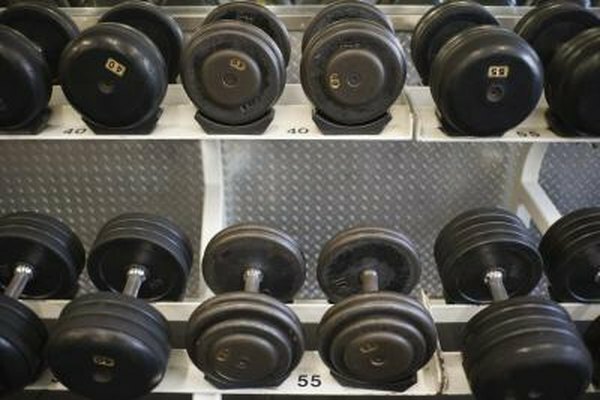 Free weights provide an effective way to strengthen the muscles of your back and increase the range of motion of the exercise. Perform back strengthening exercises once or twice a week as part of your weight training program. Always consult your physician before beginning a new exercise regimen. Bent over rows can be performed while standing or lying on a bench. From a standing position, bend over at the hips with your knees slightly bent. If you're using a bench, lie face down with your feet on the ground and torso on the bench. Hold a dumbbell in each hand and maintain a flat back throughout the exercise. Let your arms hang down to start, then pull the weights up to your chest. Keep your palms facing behind you and your head in neutral alignment with your spine. Slowly lower the weights and repeat. Do two or more sets of 10 to 15 repetitions. Single arm rows, which strengthen the upper back muscles between your shoulders, require a bench. Start by bending at the waist and placing your right hand and knee on a bench. Your left foot remains on the floor, while your left hand holds a free weight and rests next to the bench with your palm facing in. Pull the weight up toward your torso in a rowing motion while keeping your elbow by your side. Once your hand reaches waist height, slowly lower your arm back down. Perform 10 to 15 repetitions, then switch sides. Do two or more sets on each side. Upright rows performed with free weights work your trapezius muscles and deltoids. Stand with your feet hip-width apart with a dumbbell in each hand. Start with your hands in front of your thighs, then bend at the elbows and bring the weights up toward your chin until your elbows reach shoulder height. Hold the weights at shoulder level for two seconds, slowly lower your arms, and then repeat. Perform two or more sets of 10 to 15 repetitions. Deadlifts target each muscle in your back, especially the lower part. Your lower back remains contracted as you perform the exercise, which helps you learn to keep your back straight when lifting heavy loads. Start with your knees slightly bent and your legs shoulder-width apart. Holding a dumbbell in each hand, bend at the hips and lower the weights in front of your legs. Bend your knees as you bring the weights down toward the ground. Keep your upper back flat with a slight arch in your lower back. Return to a standing position by pushing through your legs, keeping your back straight and head up. Do not round your lower back as you complete the movement. Perform two or more sets of 10 to 15 repetitions.